In this passage we learn that a priest may attend to the body of six different family members: his mother, his father, his son, his daughter, his brother, or his unmarried sister. However, this list seems incomplete. What about his wife? Is the Torah so insensitive that it does not allow a priest to attend the funeral of his own wife? Even though she is not literally related to him as the others in this list are, shouldn’t the Torah make an exception for his beloved wife? If we understand the Torah the way our rabbis do, then the Torah speaks plainly about the inclusion of the wife of a priest in this list. Our English translation introduces the list of exceptions with the descriptive phrase, “his closest relatives.” However, a more accurate translation of this phrase would be, “for the relative nearest him.” Rather than being an introduction to the list of six relatives that he may become ritually contaminated by, the Torah is actually referring to a seventh family member, the one whom he is closest to. Who is this person who is closer than these other six family members? Rashi, stating the general consensus of opinion by the majority of rabbinic interpretations, says it is none other than his wife. How is it that his wife, who is not a blood-relative, is included in this list? This is based on the creation account in which Eve was taken from the very flesh of Adam and then given back to him. When he sees her for the first time, his reaction is, “This at last is bone of my bones and flesh of my flesh; she shall be called Woman, because she was taken out of Man” (Genesis 2:23). Adam saw his newly acquired wife as not merely another individual, but an extension of himself. 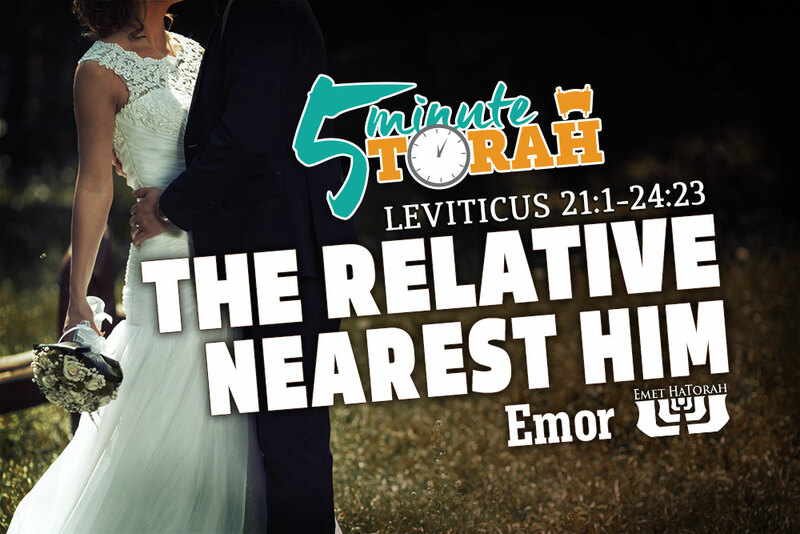 The very next verse of the Torah emphasizes this point by declaring, “Therefore a man shall leave his father and his mother and hold fast to his wife, and they shall become one flesh” (vs. 24). Throughout history this sacred unity has been under attack. From infidelity, divorce, neglect, abuse, and redefining the boundaries of marriage according to standards contrary to the biblical parameters, the relationship between a husband and wife has constantly become victim to the whims of our flesh and the toxic culture we live in. The Torah teaches us that a man’s wife becomes one with his own flesh, his poor treatment of her is to his own detriment. We also read, “He who finds a wife finds a good thing and obtains favor from the LORD” (Proverbs 18:22). This is how we should view this sacred and mysterious unity of a man and woman. We should always remember that within it we find one of the most precious gifts God has given to human beings. The Levitical priesthood could not allow themselves to become ritually impure except for the most strict circumstances, which included the deaths of one’s nearest relatives. Who is closer to a man than his wife? No one. She is the relative nearest him.